Billy Pilgrim is a man who comes unstuck in time, and experiences events in his life out of order, including the bombing of Dresden during WWII, and his abduction by aliens called the Tralfamadorians. I appreciate the anti-war qualities of this book. And, it was enjoyable enough to read. But I'm not seeing it as the amazing work of art the world expects me to. My first impression was that I felt like I was reading Catcher in the Rye. It's written in that same sort of way, like you're just reading the random thoughts that someone jotted down. And I don't mind that; I enjoyed reading Catcher in the Rye. But another thing those books share in common is that people see something deeper there that I'm just not getting. My best friend and I have an ongoing argument, in which I insist that I hated English class, and don't feel that I'm missing anything in life from not having learned how to properly "analyse" books, and she insists that I'd appreciate books more if I learned these things. Maybe she's right when it comes to books like this one, but in that case, my argument is that these books just aren't for me, and I'd be happier continuing on with books whose messages are clear without having to do that analysis. So I'll admit that my life not being changed by this apparently life-changing work may be through faults of my own. If anyone wants to tell me what is meant to be amazing in this story, go ahead! Also, as a sci-fi fan, I don't care for the concept of time used in this book. If you know the plane you're getting on is going to crash, why would you get on the plane? I don't care if you've come to believe that the future can't be changed, it's clear that you could change it by just not getting on the plane! Star Trek has taught me many theories of time travel, and in none of them would these actions make any sense. This was the book of the month for the Goodreads Book Compatibility Test Readers group. 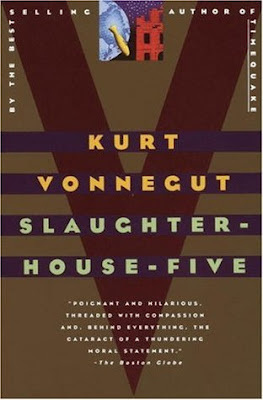 Congratulations for sticking with "Slaughterhouse-Five" -- it can be a tough read. 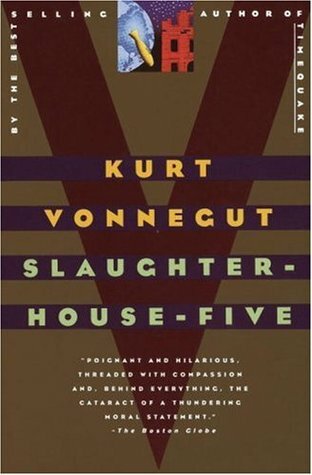 (Other Vonnegut works have a lighter tone to them, such as "Breakfast of Champions.") With Banned Books Week looming and this book being on the often-banned list for its language and adult themes, we'd love to hear your thoughts on whether or not you think it's appropriate for high school students. I know how you feel and since I agree with you, I can't really help. I tend to avoid books that I really just don't enjoy. The Towering Pile is moving! Not far, though. Introducing the List of Seven!